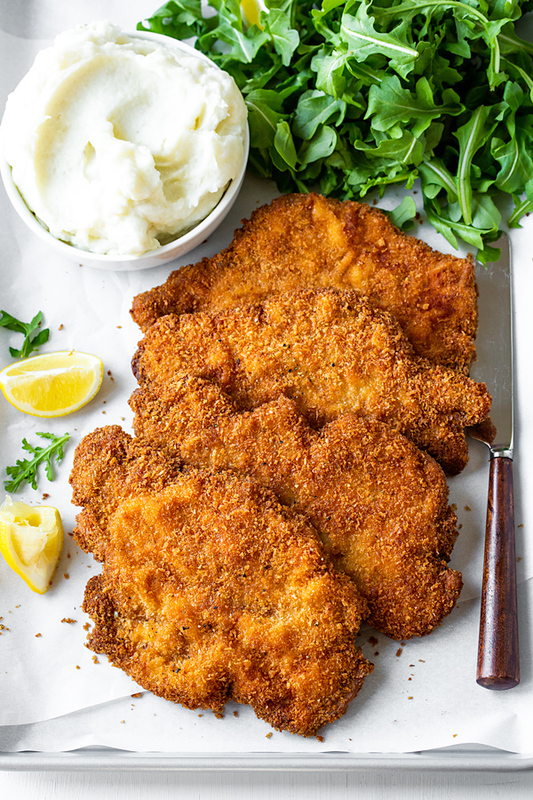 This crisp, golden, and juicy schnitzel is the classic European-style meal, deliciously comforting and cozy! 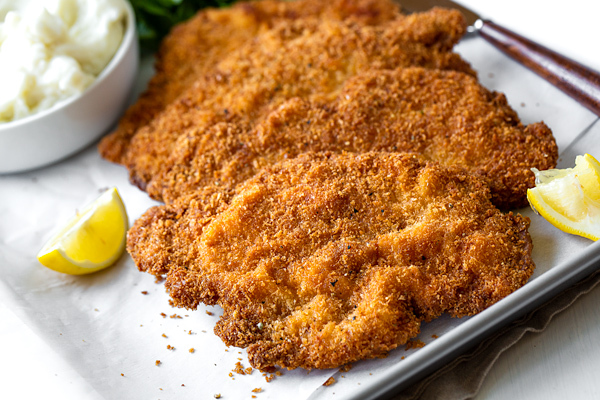 Growing up in an eastern European household, I had the pleasure of enjoying a lot of schnitzel in my earlier years, and I’m happy to share this delicious tradition has carried over into present time. 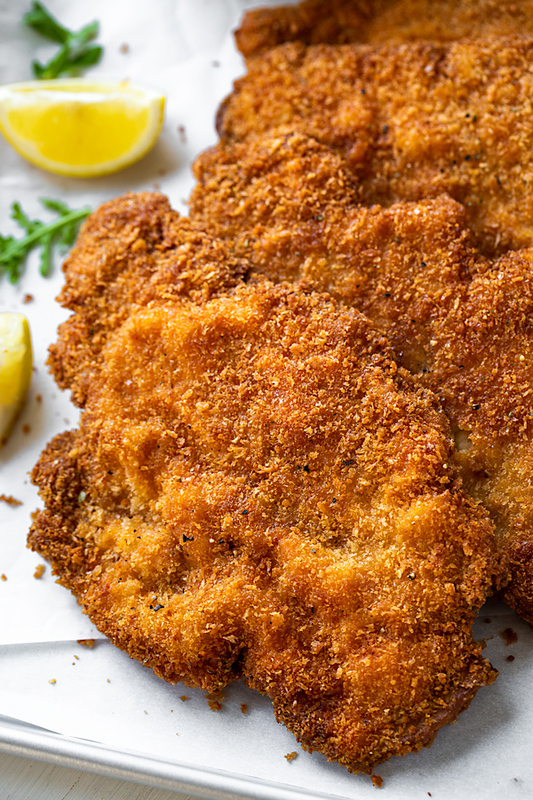 Schnitzel is that classic comfort food, a European favorite that is so simple and easy to make, yet is somehow filled with the most complex and delicious flavors of love, home, and care. And this for me represents all that is so very beautiful and nourishing about home cooking. I have very vivid memories of my mom preparing her schnitzel recipe, often with chicken earlier on, and later with pork. First, she would gently tenderize the meat, then season it to give it delicious flavor. Next, she would set up her little dredging station consisting of a large bowl filled with flour, a second large bowl containing a couple of whisked eggs, and a third large bowl filled with breadcrumbs. She would dip each cutlet of meat into the flour, then the eggs, then the breadcrumbs, and place it onto a plate to hold until all the cutlets were gloriously coated in the crumbs. And when she was ready to begin frying, she would heat her oil in a large pan, and place batches of the breaded schnitzel cutlets into the hot oil to gently fry for a few minutes on each side to crispy perfection. I remember the way the house would smell whenever she would prepare schnitzel, the aromas so savory, comforting, and enticing. I can still recall the the sounds the schnitzel would make as it fried in the pan, gently hissing and occasionally popping in the hot oil, becoming evermore golden-brown and enticing with each minute! It was such as savory and simple meal, one that she would almost always, without deviation, serve with the traditional sides of fluffy mashed potatoes and a crisp, tangy salad made with a simple dressing of little lemon, olive oil, and salt. What fond memories food can bring up… what comfort, joy, and pleasure! Simply put, “schnitzel” is a term used for the preparation of lightly pounded, breaded and fried cutlets of meat. Traditional Wiener schnitzel (Viennese schnitzel) is made only with veal; but other versions of schnitzel can include the use of chicken, pork, mutton, reindeer, or beef—whatever meat is available and preferred. The meat requires only a very basic seasoning such as salt and pepper, and perhaps even a sprinkle of paprika, which my mom would often use in her recipe. And finally, the breaded cutlets are fried in hot oil or fat, and served most traditionally garnished with lemon, and with potatoes with parsley as an accompaniment. Get out some stress & give the cutlets a pounding! To tenderize the cutlets of meat and prep them for their dip in the flour, eggs, and breadcrumbs, give them a little pounding with a mallet once you slice them. And if you don’t have a mallet, just slice the meat nice and thin, and you should do well with that. Choose your breadcrumbs: The more fine, standard breadcrumbs are used for traditional schnitzel preparation; but for a little more crunch and texture, I personally like to modernize things a little bit by using a combo of half panko and half traditional bread crumbs. Hot oil for crispy schnitzel: When frying the schnitzel, use a large pan (doesn’t have to be too deep, either) and a neutral oil such as canola, vegetable, or avocado. Make sure that the oil is nice and hot before adding in your breaded cutlets; and you can do this by dropping in a little piece of breading to see if it sizzles, or by placing the handle of a wooden spoon into the oil—if little bubbles begin forming around it, you’re good to go. 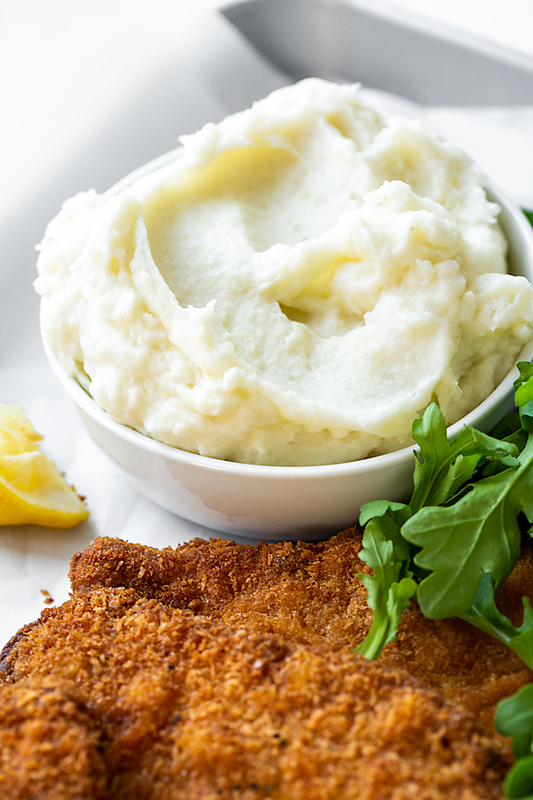 Traditional sides: For an authentic way to serve schnitzel, you can accompany it with boiled or mashed potatoes, and something a little acidic, like a salad. 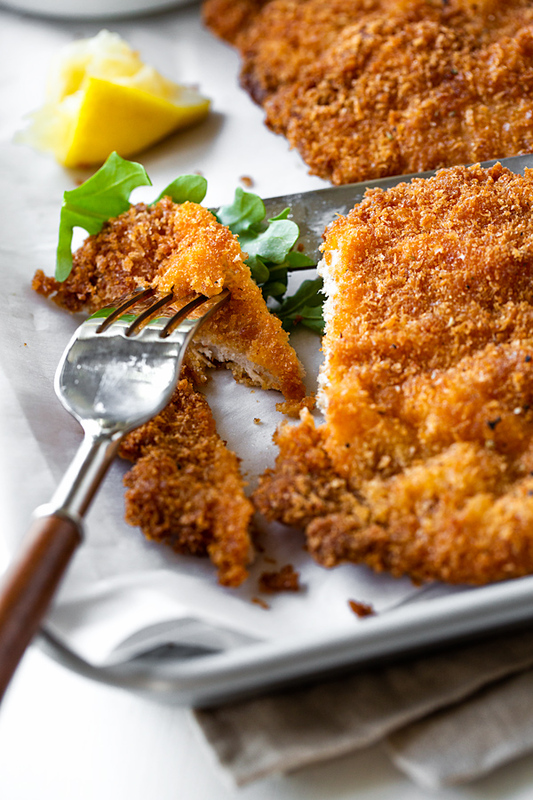 This juicy and delicious schnitzel is prepared with a combination of panko and traditional breadcrumbs for an extra crispy and golden crust, and offers a taste of traditional European comfort food! –-Begin by pounding out the pork loin cutlets using a small mallet, to tenderize; place the cutlets into a medium sized bowl and add the garlic, paprika, a couple of generous pinches of salt and pepper, and rub the seasoning into the cutlets; marinate for about 20 minutes, or even overnight if prepping ahead. –When you are ready to bread the cutlets, prepare your breading station by having the flour in a large bowl or plate; having the whisked eggs in a large bowl; and having both the panko and the traditional breadcrumbs to another large bowl or plate; then, prepare another large plate to lay the breaded cutlets onto to hold for frying. –Dip each cutlet into the flour, shaking off the excess, then into the egg wash, then the breadcrumbs, coating thoroughly; repeat the process until all cutlets are breaded. –To a large frying pan add enough oil to fill the pan about 1/3 of the way up; heat the oil on medium-high heat for a few minutes, and check the readiness by dropping in a small piece of the breading to see if it fries and floats; once hot, add the breaded cutlets to the hot oil (work in batches if necessary), and fry for about 3-4 minutes per side or until golden brown; remove and place onto a wire rack to drain; repeat with any remaining pork cutlets. –Serve hot, garnished with lemon and parsley, if desired, and with your choice of sides. When can I come over to eat this out of control Pork Schnitzel and mashed potatoes! 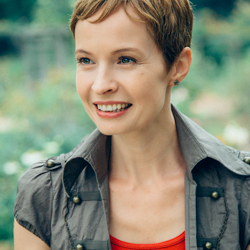 Love all your posts Ingrid! Natalie, you’re invited to come on over anytime you’d like, my friend!! This sounds like the perfect meal for a cold winter day! I am going to make this next week for sure!! Oh Ingrid, schnitzel is irresistible! And from one Michigan gal to another, I can see this being incredibly satisfying during those mitten winters! What a well balanced and delicious meal! I have a pork roast in the oven right now and although I’m pretty excited about it, now that I’ve seen your post, I kinda wish it would take the form of schnitzel when it’s done. Looks great! I just came across your Blog on TK! Hi Amrita, chicken works great- I actually interchange them depending on what I have on hand. Let me know what you think if you give this a try! I made the whole meal last night -DELICIOUS!!!!! Everyone loved it (which doesn’t happen very often in my house)! Thank you for sharing the recipe. Hi Olya, that is so wonderful! And thank you for sharing with me your experience- it absolutely tickles me to know that you made the whole meal and that your family enjoyed it. I truly appreciate you coming by and taking the time to comment, my friend! I love lemony salads – will have to try yours! I love cruising the net looking for recipes. I stumbled onto your site and found this one. My wife and I tag teamed it, had great fun making it. The dish turned out great, we really enjoyed it!!! Thank you! Hey Denis! So glad you both enjoyed, and in my opinion, there’s no better way to have fun in the kitchen for a couple than tag-teaming dinner— I love to do this with my hubby, as well. Thanks so much for commenting, and here’s to more happy cooking to both of you! 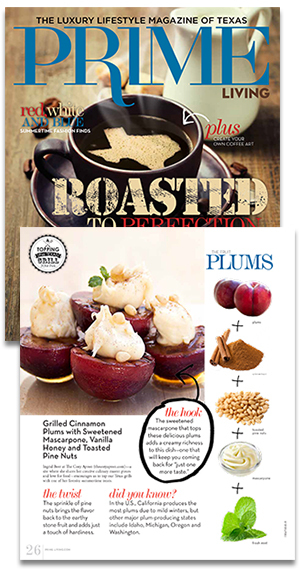 Hope you find some more recipes here on our site! I feel like I have found a home on your site, made the Rigatoni Meatball Soup tonight, again delicious. Have found lots I want to try. Denis, that makes me so, so happy…thank you for letting me know that. So glad you were comforted by the rigatoni meatball soup tonight, and I’m thrilled that you have more of our recipes on your “list” to try. I feel the panko crumbs make a better crust and don’t burn as easily as traditional crumbs. However, I run the panko through the food processor first to make a smaller crumb. To me it makes it more authentic tasting. My best schnitzels have been made using clarified butter or ghee. Hi Jeremy, thanks for sharing your personal method! The ghee or clarified butter sounds delicious! I miss the Gratin part of this recipe, I winged it from memory but never nailed it.